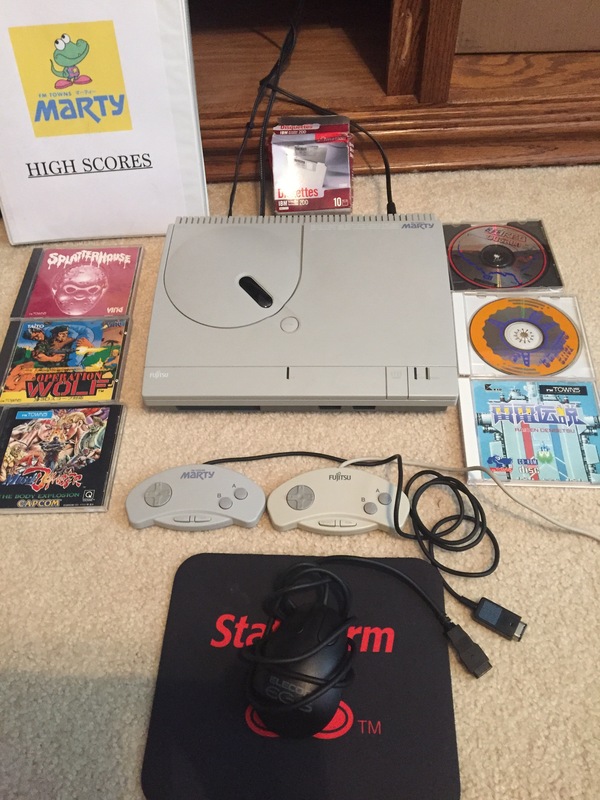 Note: I bought an FM Towns Marty console from Italy a few years ago, and although I can find bits of information on it and the games for it here and there on the internet, it’s been frustrating at times, so I’m making this post for others who want to know about the system. I am not a ‘tech spec’ guy, so this is an ‘every-man’s’ guide to the system. This probably won’t answer every question and someone who knows more than me about this system will probably think, “No, he’s wrong about X,” but hey, this is the best I can do! 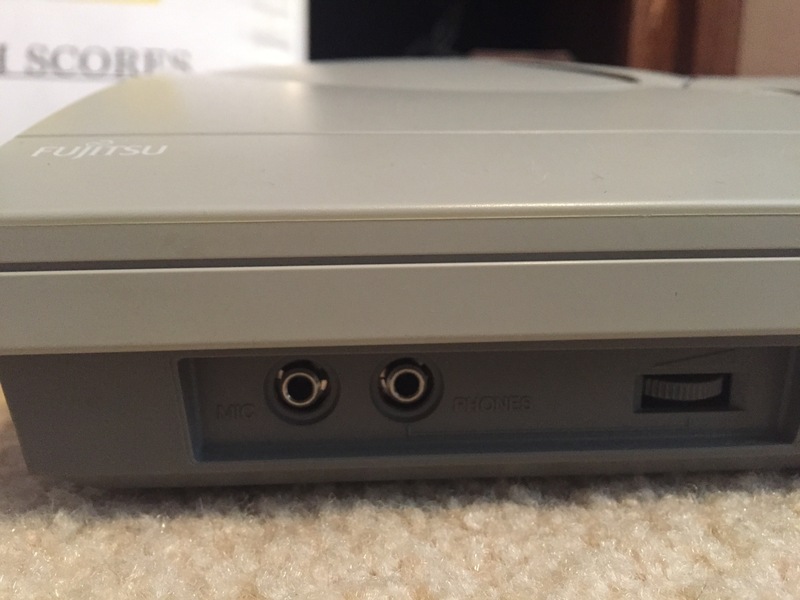 Console: The FM Towns Marty is a consolized version of the FM Towns computer, both of which were only released in Japan. 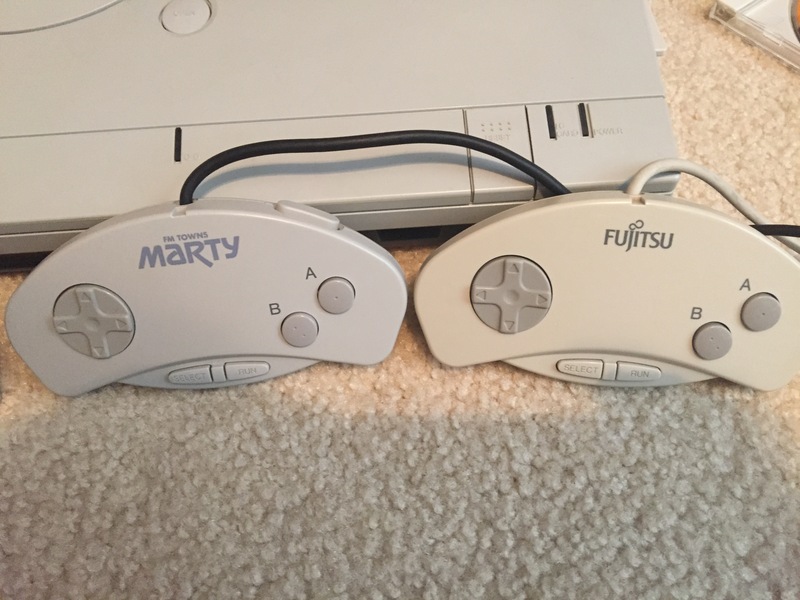 There were two versions of the Marty. I have version 1, but the consensus from what I can find on the internet suggests there are no internal differences, only the external color differences between the versions. The Marty plays both floppy disk games and CD games. 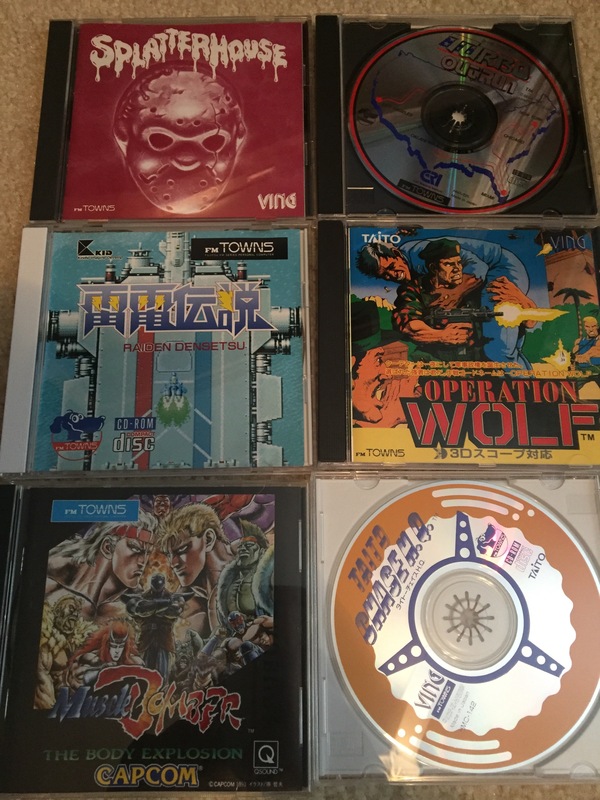 Some CD games require a floppy disk as well. Not all games that work for the FM Towns computer will work for the Marty, basically because the Marty is not powerful enough for some bigger games. The internet consensus is that no game over 2MB will run on the Marty. You can search online for a compatibility list. 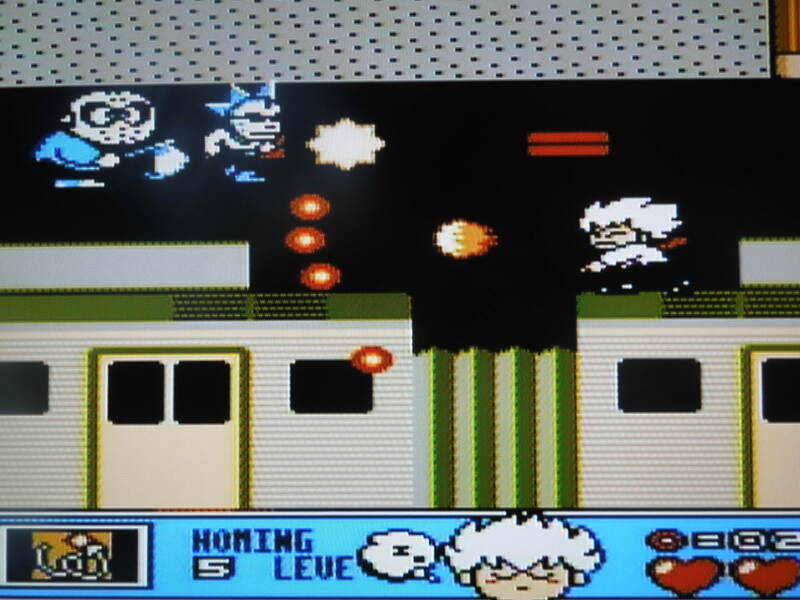 Some games were designed with the limitations of the Marty in mind, while others were made with the intention of being played on the proper FM Towns home computer. Inputs and Controller Ports. 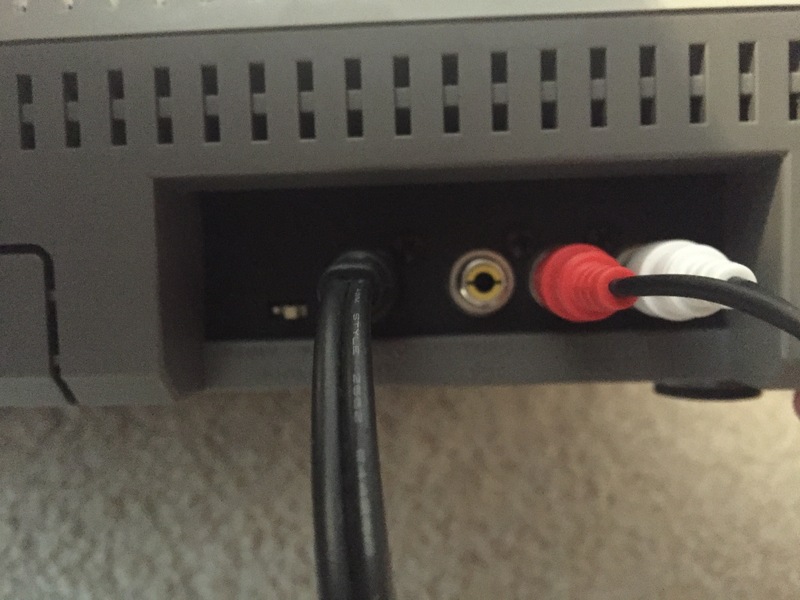 The Marty has composite and S-video outputs. 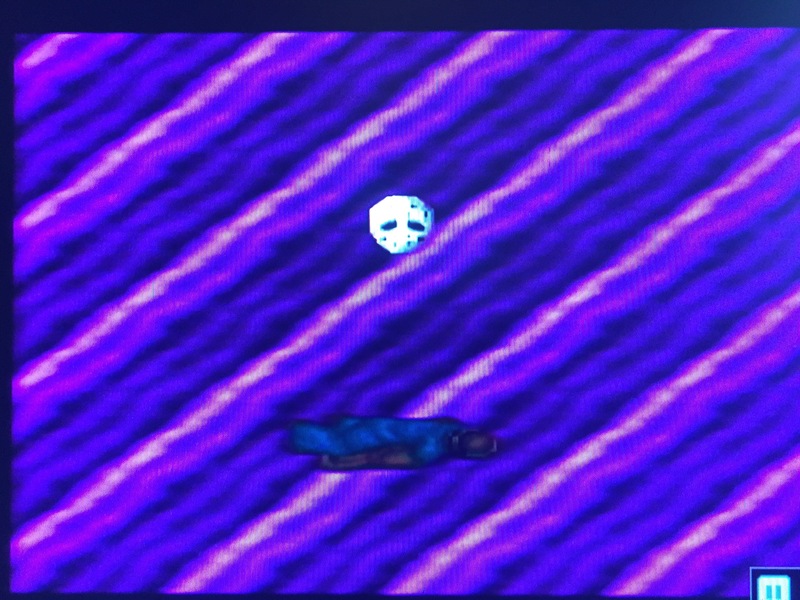 The S-video looks great. There’s also a switch that you can flip in the back that in some way appears to impact the clarity of the picture, although it’s minimal. 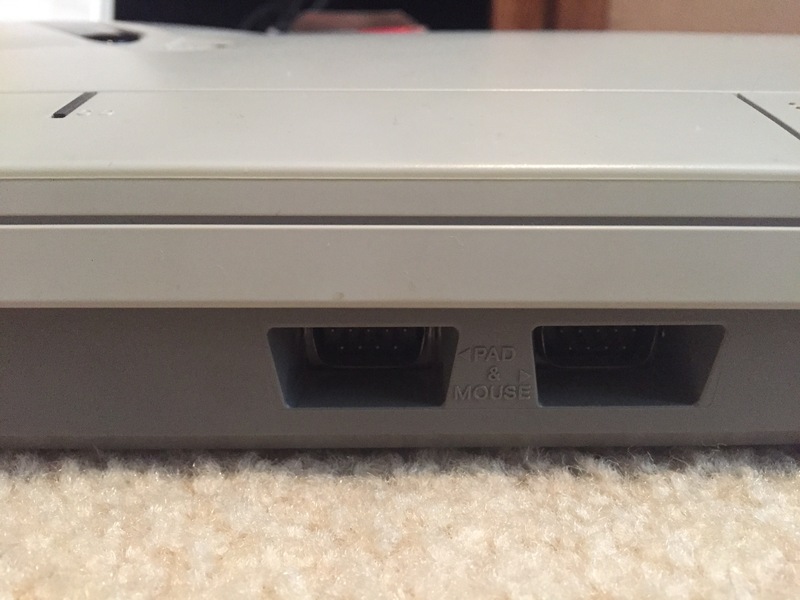 There are two controller ports on the front. The 2nd one is labeled ‘mouse,’ as some games can only be played with a mouse. A 2nd controller can still be used on this port of course for 2p games. On the right of the console is a port for a keyboard. Remember, the system was created as a console version of a computer. Also, apparently some games that WILL run on a Marty REQUIRE a keyboard to be connected to the Marty. 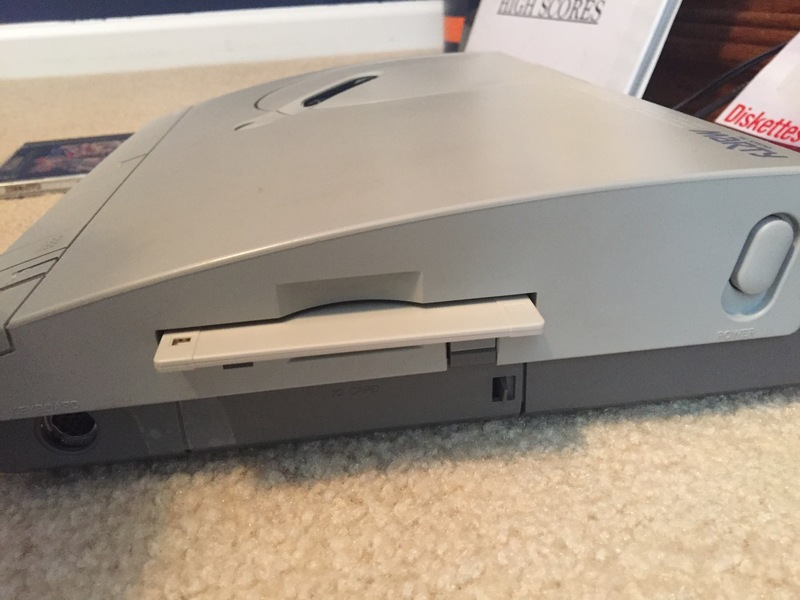 Not that the CD won’t run, I believe, but because you need to press a button on the keyboard to advance and you are stuck on a screen without one. I don’t have a keyboard, and all of the games I’ll be talking about only require a controller only (actually two require a mouse only). 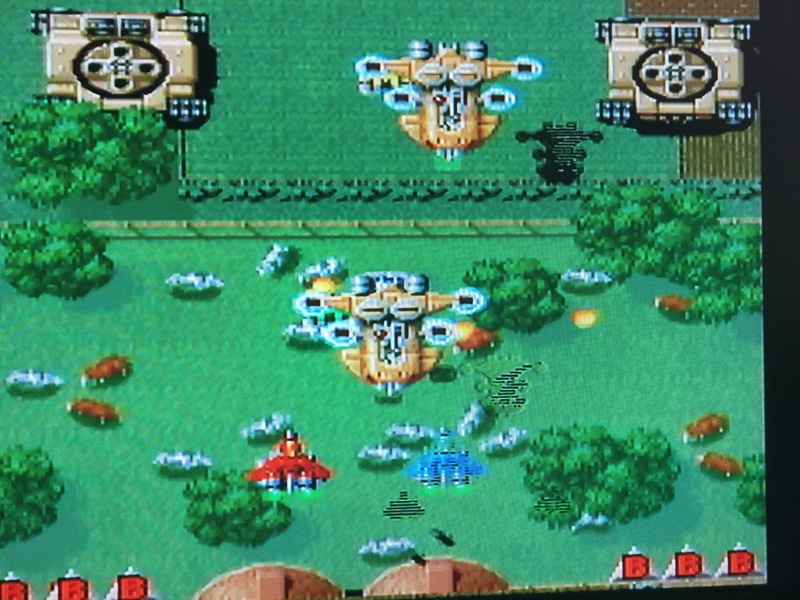 Controllers: The older I get, the more I love OLD video games, but the less I like a bunch of buttons on a controller – even the SNES controller is becoming too busy for me. I love the limited buttons of the Marty controllers. Similar to the NES in that regard. Anymore might have made me rethink buying this console! Yeah, I’m a simple man, I guess. As you hopefully can see in the picture, you can find two different versions of the controllers. Both work great. Notice the Marty one has an extra shoulder button that, from what I’ve read elsewhere, ‘changes the resolution’ in some games. I haven’t found that it does anything at all in the 7 games I’ve played, but it’s kind of cool. The controller cords are REALLY short, so buy (they’re called D9 extension cords on eBay, I THINK) extensions unless perhaps you plan to set up your Marty on your desk with your tv or monitor nearby. Mouse: I bought an Elecom mouse, but there are Fujitsu ones as well that pop up on eBay sometimes. You’ll want a mouse pad (remember those?) and a coffee table or desk top because it has the old “rolley ball” underneath, and occasionally you’ll need to clean it (very easy). Games: I own 6 games (previously 7) for this console, and here’s some basic info about each one. A lot of these were ports of arcade games and available on other consoles. Also, I play games a lot now for the purposes of fun at beating my high scores. Except for LOOM, all of these games have that option (meaning there’s a score counter). While it would seem like you should be able to save high scores seeing as there is a floppy drive, for these games, I cannot figure any way to turn on the floppy drive (and mine does work after I got a new band) while a CD game is playing. Thus, I believe it’s not possible to save high scores, at least in these games. I did own the game LOOM for awhile prior to having my floppy drive fixed, and it had a location to ‘Save,’ leading me to believe, for that game, that had I hit Save, it would have accessed the floppy drive to save my progress. Anyway, I prefer my old High Score notebook anyway. *all games have menus in English and are not hindered by any Japanese language barriers, if they have Japanese at all. Chase HQ: 1p. Only requires a controller. Story and voiceover in Japanese. Really fun racer where you chase down bad guys. FAST. LOOM: 1p. Point and Click game. I couldn’t fully describe the story, which was awesome, so look elsewhere for better detail. The music was BEAUTIFULLY done. I used to own LOOM before I sold it. It was a wonderful game that required a mouse only. Controllers wouldn’t work and a keyboard wasn’t needed. I would recommend that you ensure that your floppy drive works on your Marty because trying to beat it in 1 sitting is asking a lot. I played for 3 hours one day and don’t think I was close to beating it. 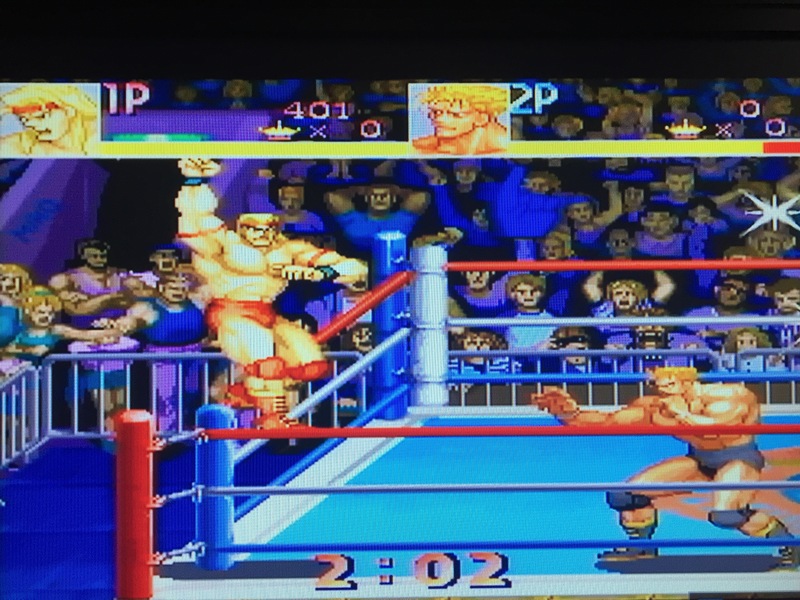 Muscle Bomber: 1p or 2p competition. I reviewed the game previously, check it out. Fun wrestling game. Operation Wolf: 1p. 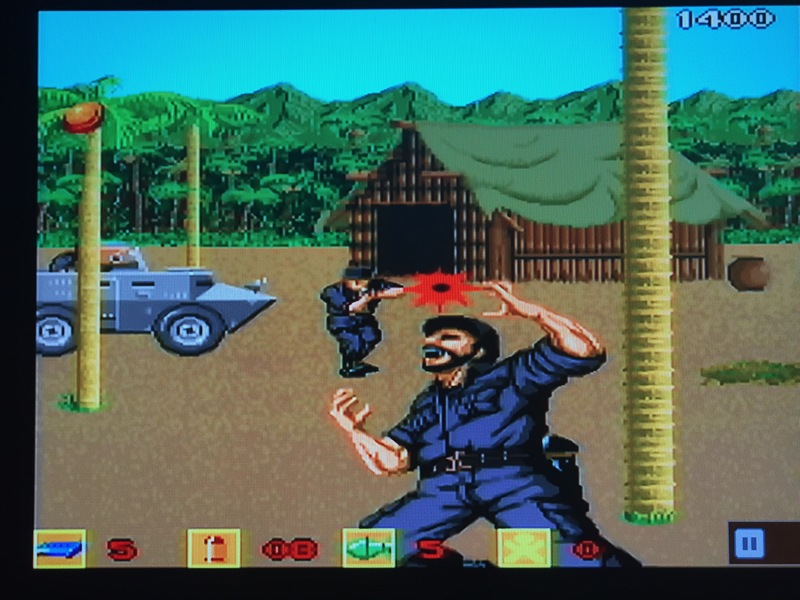 Awesome shooter that requires the mouse. Would have been cool if there was an option for a controller as an alternative, but the mouse works great. Voiceover for story is in English. Raiden Trad: 1p or 2p co-op. Awesome shooter with seriously the most exciting opening stage music I’ve ever heard. Wasn’t a huge fan of shooters until I got addicted to this one. Limits your credits with 3 difficulties, great for training yourself to beat it based on skill. Splatterhouse: 1p. See my review, but this game is one of the reasons to own a Marty! 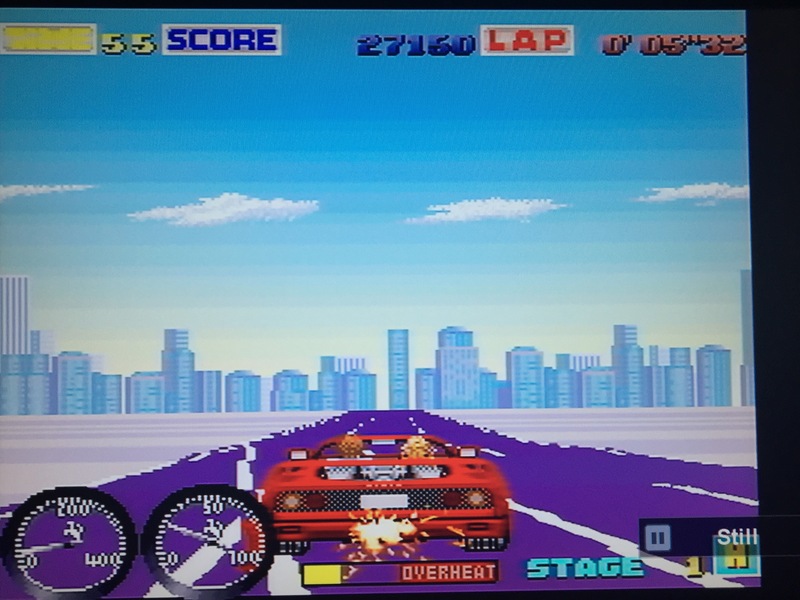 Turbo Outrun: 1p. Great racing game where you race the clock across the U.S.! Option to control using the mouse, but the controller is best. Final Info: Finding a Marty, controllers, possibly a mouse, possibly a keyboard, extensions, and games can be quite difficult. I ordered almost everything from Japan or Europe. I’ve read that some Marty’s have had problems and the CD drives no longer work. I had to replace the band on my floppy drive for it to work, although for the games I mentioned, except LOOM, the floppy drive isn’t needed. It may be frustrating trying to find which games work and which don’t. 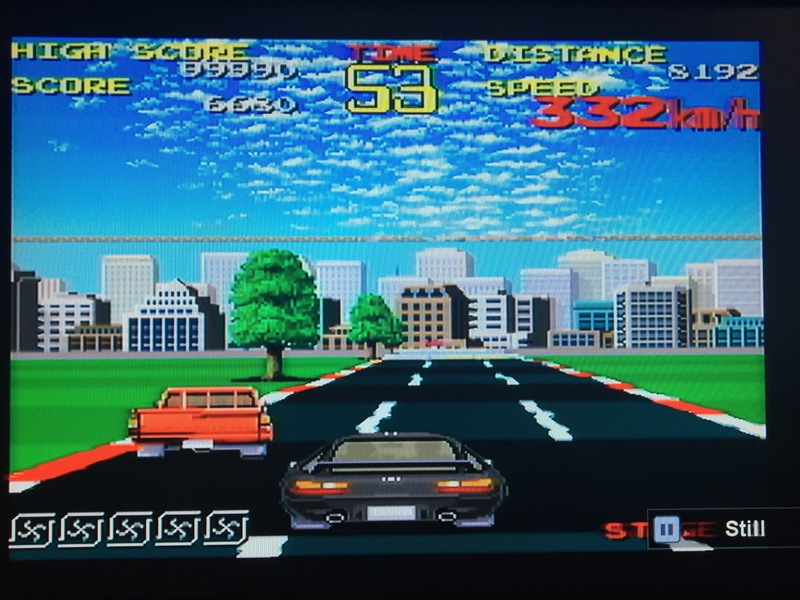 I’ve also read that some games run so much faster on the FM Towns computer and slower (even if they DO work) on the Marty. BUT, I LOVE this console! I like a limited selection of games, a simple controller, and there are some gems out there from what I’ve found so far! Happy hunting for this one! I hope this helps someone interested in the console. 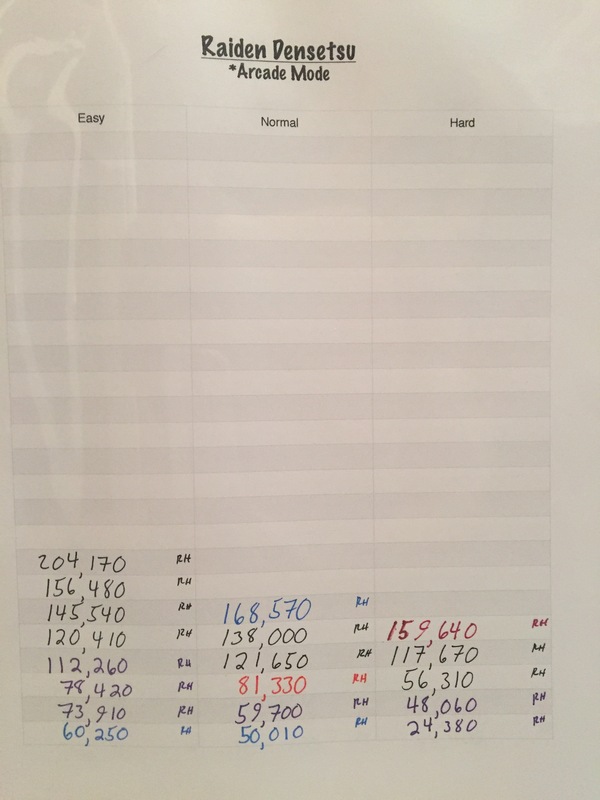 This entry was posted in FM Towns Marty - The Console. Bookmark the permalink.